The circulatory system is the most vital systems of your body that is required for the optimal distribution of oxygenated blood to all the body organs and tissues. A fully functional circulatory system aims to maintain adequate concentration of oxygen in the biological tissues to ensure longevity and health. 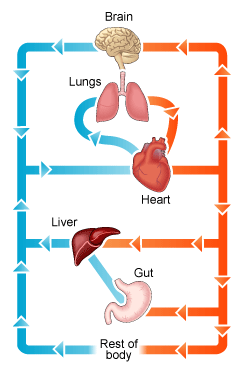 Circulatory system diagram can tell us clearly which parts are in play in the human circulation system. Heart: Human heart is a powerful pumping organ that pushes out the oxygenated blood from the left ventricle to be distributed to the periphery; whereas right heart collects deoxygenated blood (low in oxygen saturation) from the periphery. Arteries: These are the vessels or channels that pushthe oxygenated blood away from the heart towards the organs. Veins: These channels move the oxygen-poor blood from organs to the heart from where the blood is moved in the pulmonary system for oxygenation. Capillaries: these are small vessel that marks the junction of arteries and veins. These vessels have extremely thin walls that are helpful in the gaseous exchange. Transportation of gases i.e. oxygen and carbon dioxide. Maintenance of tissue perfusion so that the muscles will not fatigue. Carries nutrition to the whole body and gets rid of waste products or poisons. The blood components regulatemultiple functions such as immune system, clotting mechanisms, etc. A systemic circuit represents the flow of blood around the organs and then movement of deoxygenated blood (which contains carbon dioxide and other waste materials) back to the heart. It covers the movement of blood from heart to the lungs where the oxygenation of blood takes place. In oxygenation the waste material and carbon dioxide are removed from the blood while oxygen is taken up by the red blood cells. This circuit typically includes the movement of blood inside heart and ‘myocardium’ (the membrane of heart). Coronary circuit mainly consists of cardiac veins including anterior cardiac vein, small vein, middle vein and great (large) cardiac vein. 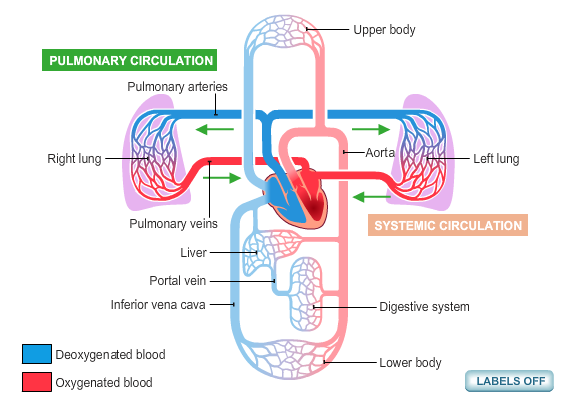 How Does the Human Circulatory System Work? Heart consists of four chambers namely right atria, left atria, right ventricle and left ventricle. Both the atrium and ventricles are separated from each other with a muscular septum. Valves are present in between atria and ventricle which helps in draining the blood from upper part to lower part of the body. The right side of the heart contains deoxygenated blood from where the blood is moved to the lungs for oxygenation (addition of oxygen in blood), the oxygenated blood is then carried to left side of heart from where it is supplied to tissues. Vessels are vascular channels of the circulatory system that provide conduit to the blood (from organs to the heart and then back to organs). The blood vessels can be classified into following sub-types, based on the anatomical and physiological characteristics. These blood vessels are responsible for carrying the blood from heart to different parts of body. Almost all the arteries carry oxygenated blood. Arteries have thick wallsor in other words arterial walls have a thicker muscle coat. The pressure of blood flow is highest as soon as the blood enters in aorta from the left ventricle. This high blood pressure is the driving force that pulls the blood against the gravity. These vessels are responsible for carrying the blood from the organs to the heart. Most veins carry deoxygenated blood. Veins have thin walls than arteries. The blood flow is not driven by high pressure. They are very small microscopic structures, present in muscle and lungs. Oxygen and carbon dioxide are exchanged in the capillaries. Though not visible on the human circulatory system diagram, human blood plays a very important role. The blood along with its major components (like blood cells and proteins) also contain gases which are transported in the tissues for effective functioning. Red Blood Cells: These are also called as erythrocytes, due to high concentration of red-colored pigment (also known as hemoglobin). It is noteworthy that one molecule of hemoglobin offer four attachment sites for oxygen in its structure (to form oxy-hemoglobin – the transport form of oxygen in the blood). White blood cells: These are also called as leukocytes. White blood cells are helpful in the maintenance and regulation of the immune system of body. Platelets: These are also known as thrombocytes. Platelets are the most important blood component for the maintenance of coagulation and clotting factors of the blood. Blood gases like O2 and CO2: Along with the formed elements, human blood also carries blood gases. Most abundant gases includeoxygen (which is to be distributed in the tissues) and carbon dioxide (which is the most common by-product of metabolic and biological processes and needs to be eliminated via lungs). On an average a normal adult contains approximately 5 to 6 quarts of blood circulating in the body at any given point of time. This quantity of blood is composed of 55 percent blood and 45 formed elements (which are red blood cells, white blood cells and platelets). The heart is anatomically located at the midline of chest, slightly diverted towards the left side. The average size of heart is two hands held together. The vascular system present in the body measures approximately 60,000 miles.